04/05/03 Kevin B That looks like it could be jimmy horton in the #85 at the lower right. 04/15/03 Jerry I think the #10 is Richie Eurich.I think he had a red car at one point. 05/26/03 Steve K Great shot! I think the white car is #92 Mike Barlow who moved up from the Street Stocks. 09/06/03 Wes Suydam The red #10 in this picture is Jimmy Cathers. 11/25/03 Pimp The 10 could be Cathers no doubt about it but I think it could be Eddie Haenelt...I know that trailer in the pits is his...the one that says Buick on it...just my opinion. 01/21/05 Mark Flamisch This photo is definitely from 1988 because the Miller cars (Chuck McKee's #19 and all other cars sponsored by the company) switched to the Miller High Life Gold colors for the '88 season after using the red and white "Miller American" theme up until '87. 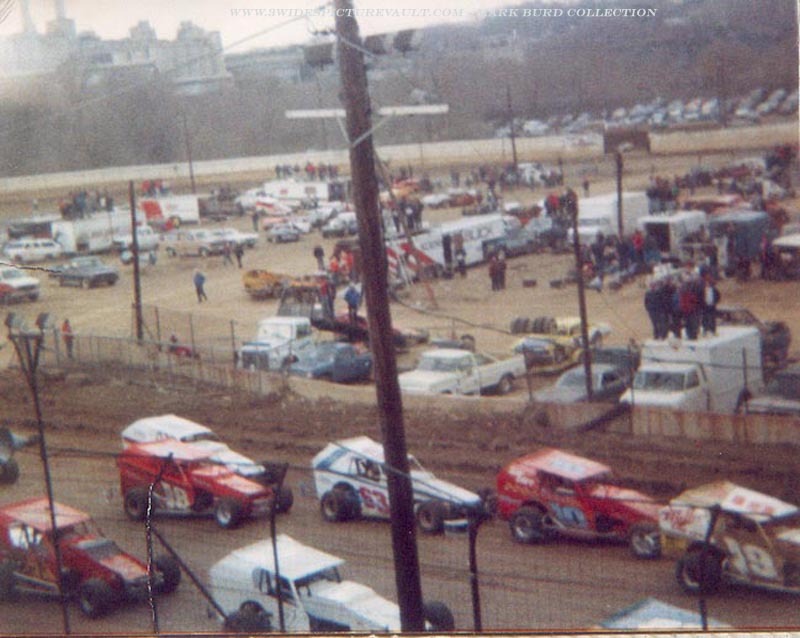 The red 10J is Eddie Haenelt, as noted by the trailer in the background, with Neil Kumernitsky's #63, George Hildebrant's #18, Fritz Epright in the Trenton Mack #74, Butch Tittle in the #Z, and Whitey Kidd, Jr. in the blue #95. While Whitey's car does bear a resemblance to the S&H #85 of Jimmy Horton, Jimmy didn't make a single appearance at Nazareth during the track's final season (This is the year Jimmy tried for Rookie of the Year on the Winston Cup Circuit) This shot has to be from one of the two March races run the year, because the Trenton Mack #74 never appeared again after the first few shows, although Fritz did, wheeling the Barker Bus #76 to an August win that year. I love this pic, really brings you back to being there. See the factory in the background! Joe or Mark was the photo taken in 1987 spring practice or was it during a race that season. Reason being is I drove an all white Olsen car in the 87 spring practice at Nazareth along with Newt Hartman.